For other uses, see Sauce (disambiguation). In cooking, a sauce is a liquid, cream, or semi-solid food, served on or used in preparing other foods. Most sauces are not normally consumed by themselves; they add flavor, moisture, and visual appeal to a dish. Sauce is a French word taken from the Latin salsa, meaning salted. Possibly the oldest recorded European sauce is garum, the fish sauce used by the Ancient Greeks; while doubanjiang, the Chinese soy bean paste is mentioned in Rites of Zhou in the 3rd century BC. Sauces need a liquid component. Sauces are an essential element in cuisines all over the world. 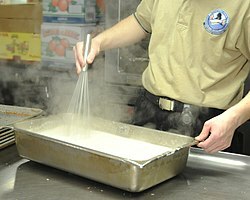 Sauces may be used for sweet or savory dishes. They may be prepared and served cold, like mayonnaise, prepared cold but served lukewarm like pesto, cooked and served warm like bechamel or cooked and served cold like apple sauce. They may be freshly prepared by the cook, especially in restaurants, but today many sauces are sold premade and packaged like Worcestershire sauce, HP Sauce, soy sauce or ketchup. Sauces for salad are called salad dressing. Sauces made by deglazing a pan are called pan sauces. A chef who specializes in making sauces is called a saucier. 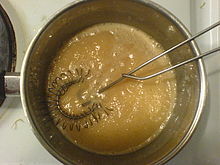 Sauces used in traditional Japanese cuisine are usually based on shōyu (soy sauce), miso or dashi. Ponzu, citrus-flavored soy sauce, and yakitori no tare, sweetened rich soy sauce, are examples of shōyu-based sauces. Miso-based sauces include gomamiso, miso with ground sesame, and amamiso, sweetened miso. In modern Japanese cuisine, the word "sauce" often refers to Worcestershire sauce, introduced in the 19th century and modified to suit Japanese tastes. Tonkatsu, okonomiyaki, and yakisoba sauces are based on this sauce. Japanese sauce or wasabi sauce is used on sushi and sashimi or mixed with soy sauce to make wasabi-joyu. Some sauces in Chinese cuisine are soy sauce, doubanjiang, hoisin sauce, sweet bean sauce, chili sauces, oyster sauce, and sweet and sour sauce. Korean cuisine uses sauces such as doenjang, gochujang, samjang, aekjeot, and soy sauce. Southeast Asian cuisines, such as Thai and Vietnamese cuisine, often use fish sauce, made from fermented fish. 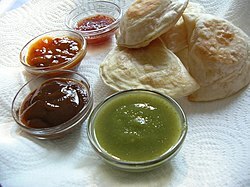 Indian cuisines use sauces such as tomato-based sauces with varying spice combinations (mistakenly referred to as generically "curry" by some Western cultures, initially due to British generalization of Indian sauces and spice blends), tamarind sauce, coconut milk-/paste-based sauces, and chutneys. There are substantial regional variations in Indian cuisine, but many sauces use a seasoned mix of onion, ginger and garlic paste as the base of various gravies and sauces. Various cooking oils, ghee and/or cream are also regular ingredients in Indian sauces. Filipino cuisine typically uses "toyomansi" (soy sauce with kalamansi lime) as well as different varieties of suka, patis, bagoong and banana ketchup, among others. Indonesian cuisine uses typical sauces such as kecap manis (sweet soy sauce), bumbu kacang (peanut sauce) and tauco, while popular hot and spicy sauces are sambal, dabu-dabu and rica-rica. In traditional British cuisine, gravy is a sauce used on roast dinner. The sole survivor of the medieval bread-thickened sauces, bread sauce is one of the oldest sauces in British cooking. Apple sauce, mint sauce and horseradish sauce are used on meat (usually on pork, lamb and beef respectively). Redcurrant jelly, mint jelly, and white sauce may also be used. Salad cream is sometimes used on salads. Ketchup and brown sauce are used on fast-food type dishes. Strong English mustard is also used on various foods, as is Worcestershire sauce. Custard is a popular dessert sauce. Other popular sauces include mushroom sauce, marie rose sauce (as used in a prawn cocktail), whisky sauce (for serving with haggis), Albert sauce (horseradish sauce to enhance flavour of braised beef) and cheddar sauce (as used in cauliflower or macaroni and cheese). In contemporary British cuisine, owing to the wide diversity of British society today, there are also many sauces that are of British origin but based upon the cuisine of other countries, particularly former colonies such as India. Sauces in French cuisine date back to the Middle Ages. There were many hundreds of sauces in the culinary repertoire. In cuisine classique (roughly from the end of the 19th century until the advent of nouvelle cuisine in the 1980s), sauces were a major defining characteristic of French cuisine. In the early 19th century, the chef Marie-Antoine Carême created an extensive list of sauces, many of which were original recipes. It is unknown how many sauces Carême is responsible for, but it is estimated to be in the hundreds. The cream sauce, in its most popular form around the world, was concurrently created by another chef, Dennis Leblanc, working in the same kitchen as Carême. Carême considered the four grandes sauces to be espagnole, velouté, allemande, and béchamel, from which a large variety of petites sauces could be composed. A sauce which is derived from one of the mother sauces by augmenting with additional ingredients is sometimes called a "daughter sauce" or "secondary sauce". Most sauces commonly used in classical cuisine are daughter sauces. For example, béchamel can be made into Mornay by the addition of grated cheese, and espagnole becomes bordelaise with the addition of reduction of red wine, shallots, and poached beef marrow. A specialized implement, the French sauce spoon, was introduced in the mid-20th century to aid in eating sauce in French cuisine, enjoying increasing popularity at high-end restaurants. "Crema al mascarpone" used to make Tiramisù and to dress panettone at Christmas and common in the North of the country. Salsas ("sauces" in Spanish) such as pico de gallo (tomato, onion and chili chopped with lemon juice), salsa cocida, salsa verde, chile, and salsa roja are a crucial part of many Latino and Spanish-American cuisines in the Americas. Typical ingredients include chili, tomato, onion, and spices; thicker sauces often contain avocado. Mexican cuisine features sauces which may contain chocolate, seeds, and chiles collectively known by the Nahua name mole (compare guacamole). Argentine cooking uses more Italian-derived sauces, such as tomato sauce, cream sauce, or pink sauce (the two mixed). Peruvian cuisine uses sauces based mostly in different varieties of ají combined with several ingredients, most notably salsa huancaína based on fresh cheese and salsa de ocopa based on peanuts or nuts. Fesenjān is a traditional Iranian sauce of pomegranates and walnuts served over meat and/or vegetables which was traditionally served for Yalda or end of winter and the Nowruz ceremony. Sauce béarnaise or Béarnaise sauce made of clarified butter and egg yolks flavored with tarragon, shallots and chervil. A beef steak served with peppercorn sauce prepared with five types of peppers. ^ Carême, Marie Antonin (1854). L'art de la cuisine française au dix-neuvième siècle (in French). 3. Paris: Au Depot de librairie. p. 1. Retrieved 7 December 2013. ^ Escoffier, Auguste; Gilbert, Philéas; Fétu, E.; Suzanne, A.; Reboul, B.; Dietrich, Ch. ; Caillat, A.; et al. (1903). Le Guide Culinaire, Aide-mémoire de cuisine pratique (in French). Paris: Émile Colin, Imprimerie de Lagny. Archived from the original on 4 January 2014. Retrieved 7 December 2013. ^ a b Escoffier, Auguste (1907). A Guide to Modern Cookery. London: William Heinemann. pp. 2, 15. Retrieved 7 December 2013. ^ "Small Sauce". Archived from the original on 14 February 2017. Retrieved 31 December 2016. ^ Sifton, Sam. "Fesenjan". cooking.nytimes. Nytimes. ^ Khoresht-e, Fesenjan. "Persian Food Primer: 10 Essential Iranian Dishes". Tasnim. Tasnim news. Retrieved 21 September 2016. ^ Noll, Daniel. "Iranian Food: A Culinary Travel Guide to What to Eat and Drink". uncorneredmarket. Retrieved 8 December 2018. Peterson, James (1998). Sauces. John Wiley & Sons. ISBN 0-471-29275-3. Sokolov, Raymond (1976). The Saucier's Apprentice. Knopf. ISBN 0-394-48920-9. McGee, Harold (1984). On Food and Cooking. Macmillan. ISBN 0-02-034621-2. McGee, Harold (1990). The Curious Cook. Macmillan. ISBN 0-86547-452-4. Corriher, Shirley (1997). "Ch. 4: sauce sense". Cookwise, the Hows and Whys of Successful Cooking (1st ed.). New York: William Morrow & Company, Inc. ISBN 0688102298. This page was last edited on 26 March 2019, at 13:06 (UTC).